Offering you a complete choice of products which include fire alarm system, fire detection and alarm system, wireless fire alarm system, wireless fire alarm and wireless gsm fire alarm system. 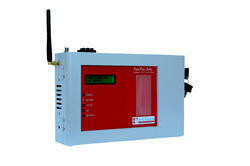 Wireless Fire Alarm System is designed & manufactured by Jyoti Telecom. It is a microcontroller based electronic Fire Alarm system. It will help you to protect your premises from the fire due to any negligence or short circuit or due to any reason. It will alert you by sending SMS and Call by using GSM SIM card. Because of GSM network no distance limit, one can check system status from any part of the country by using a cell phone. Fire Alarm System contains one active SIM card, GSM module, and microcontroller. Wireless Smoke Detector with ID no. Operating Temperature Range 0 to 50 °C. · Operating Temperature Range 0 to 50°C. Microcontroller based Wireless Fire Alarm System is designed & manufactured by Jyoti Telecom. It will help you to protect your premises from the Fire. It will alert you by the loud audio siren and it will also make telephone calls to the user mobile phone with detailed voice message when Smoke Sensor detects fire due to any negligence or due to short circuit or any reason. Its auto dialer works with GSM (SIM) network. 5 Nos Telephone Auto dialer. 48 Hrs. Inbuilt Battery Backup. · Indications- Safe zone: - Green LED periodically blinking. § Fire detection: - Red LED if fire detect. · Wireless Smoke Detector with ID no. · User friendly & easy to install. · Maximum wireless range 100Meter. · Battery backup upto 1 year. Applications: Home, Bank, Industries, Petrol Pump, Jewelry shops, Offices, Locker Room. • Secure Your Homes, Offices 24x7 from fire. • Wireless range up to 100meter. • GSM Auto Dialler Alert on 5 Mobile nos. • Wireless Smoke Detector with ID No. 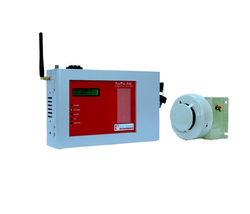 Wireless GSM Fire Alarm System is designed & manufactured by Jyoti Telecom. It is microcontroller based electronic Fire Alarm system. It will help you to protect your premises from the fire due to any negligence or short circuit or due to any reason. It will alert you by sending SMS and Call by using GSM SIM card.Because of GSM network no distance limit, one can check system status from any part of the country by using cell phone. Fire Alarm System contains one active SIM card, GSM module and micro controller and Smoke Detector. Fire Alarm System available in both type Wired and Wireless. · System Sensor Make Smoke Detector. Applications: Small Office and Shops OR Where Wiring is not possible.